A voltage only occurs between two points of different electrical potential. And a current can only flow when a conductor or resistor is in between these two potentials. This also applies to a human body which gets an electric shock: The body has to get between two voltage potentials. Only then a current can flow into the body and out again. Touching only one wire of a power cable is not enough. 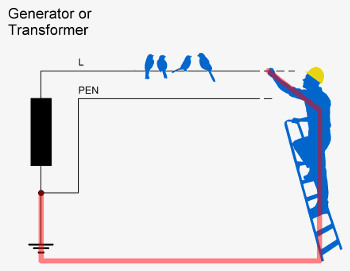 That is why birds can safely sit on a high-voltage power line without getting an electric shock - they are in contact with one wire only. A person however who gets in contact with the same power line will get an electric shock. 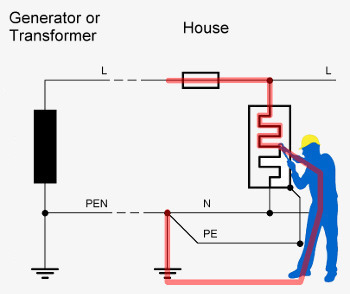 This has two reasons, first the person is standing on the ground and second, the power transformer or generator as well is connected to ground. Since ground conducts electricity the circuit is closed and a dangerous current flows through the body of the person. The function of a neon tester is based on the same principle: A (very small) current flows from line, through a neon lamp and a high ohmic resistor inside the screwdriver, through the body of the technician to ground. Because neutral is also earthed in house installations the circuit is closed and the neon lamp lights up when getting in contact with line. For safety reasons the electrical installation in buildings has to meet certain standards. One standard specifies the earthing system. One of the most common earthing systems in the world, including the developing world, is called TN-C-S (Terre Neutre Combiné Séparé). The main characteristic of TN-C-S is the combined PEN connection to the building and the strict separation of PE (Protective Earth) and N (Neutral) inside the building. 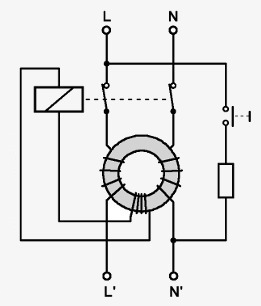 The following schematic shows the TN-C-S standard with a connected consumer, in this case a heating element. One side of the transformer is earthed and is also led as PEN (protective earth and neutral) to the houses. The other conductor is line. At the distribution point outside the house or inside the distribution board in the house PEN gets separated. Three wires - L, N and PE - get now to all wall sockets and through the power cords to all connected equipment. But why is a earthing system needed anyway? And why is it done in this way? If, due to a fault, the line connection of the heating element gets in contact with the metal housing the following would happen: A current flows from line (L) over the metal housing through the connected protective earth (PE). Since PE is connected with neutral (N) the current gets short-circuited and the fuse or circuit breaker would trip. The heater gets disconnected and the metal housing is no longer live. If no PE would have been installed or the PE connection would be interrupted the fuse would not blow. The housing would be under voltage - with deadly consequences. 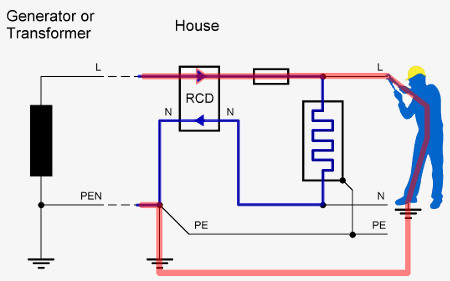 If the assumed short-circuit to the housing would be on the other side of the heating element nothing would happen because N and PE are connected together anyway. There would be no harmful potential difference. In this scenario the fuse or MCB interrupts the circuit safely when a short-circuit to ground happens inside the equipment. The fuse would also blow when the current suddenly is much higher than usual (e.g. a motor gets stuck) and the current exceeds the trip current of the MCB or fuse. But the fuse would NOT trip if a current flows through the body of a person who accidently touches line. The current through the body is too little to trip the MCB - but it is big enough to kill the person. In the following scenario a technician accidently gets in contact with a heating element. Because the technician stands on the floor a fault current flows through his body, through earth to PEN. Even if the technician does not touch line directly (half mains voltage in the image), the voltage is high enough to injure or kill him. The fatal problem is, that the current through the body is only a few mA and will not trigger the fuse. A MCB or fuse can not detect small fault currents and thus can not protect people from electric shocks. But a RCD can. The residual-current device (RCD) or ground fault interrupter (GFI) is a safety device which protects humans against electric shock. The RCD detects fault currents and disconnects all consumers instantly from the supply voltage. The RCD does not protect connected equipment from overload, fire and other damage. Fuses or circuit breakers (MCB) are still needed. 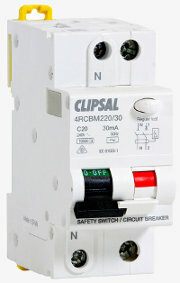 The RCD is found in the distribution board directly after the main circuit breaker and before the MCBs or fuses. Under normal circumstances line current (L) and neutral current (N) are identical (current into the load = current out of the load). In case of a failure, e.g. someone gets in contact with line, a part of the current flows back through earth and PE. This means that a part of the returning current is bypassing the RCB. N current and L current are now different. The RCD detects this unbalanced current ratio, trips a build-in contactor and all consumers get disconnected. The technology inside a RCD is simple but tricky. The RCD has two input terminals (L and N) and two output terminals (L and N). Both, L and N pass the relay contacts and are then connected to coils on a toroidal core. In a third coil a voltage is generated when a magnetic field comes into being. 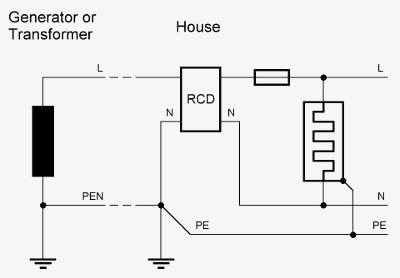 This voltage controls the relay which then interrupts the supply voltage. Usually this does not happen because L coil and N coil are identical but one of them is inverted. Both create a magnetic field when a current flows. But due to the 180 degree phase shift the resulting voltage received in the third coil is 0 V. The relay is not activated. 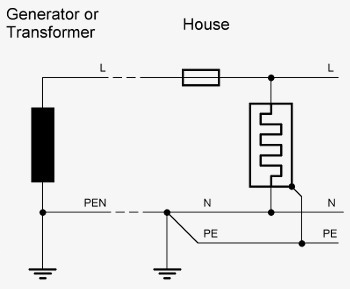 Only if the current through L and N is different a voltage is created which trips the relay and opens the contacts. Such a fault current can only happen when a part of the current which goes into a load does not go back through the RCD but is by-passed through PE. The push button and the resistor in the circuit diagram build a test function. When the button is pressed a fault current is created which bypasses the toroidal core. The relay has to release. Most of the RCDs trip at a trigger current of 30 mA. Everything higher than this is classified as residual or fault current. 30 mA RCDs are standard for house installation and for most facilities in the hospital. Special medical grade RCDs are also available. They trip already at lower currents e.g. at 10 mA. For 3-phase installation also 3-phase RCDs are available. Beside N all three lines (L1 - L3) go through the RCD. Note the white test push button. It is not a mechanical release mechanism but a real test where a fault current is created.